How Well Does Congress Represent Us? The Cooperative Congressional Election Study has measured public opinion on key legislation over a 10-year span from 2006 - 2016, allowing a systematic analysis of how Congress represents the American public. The study examined the key national issues and legislation during this time period, ranging from health care to budgeting to trade to the conduct of wars in Iraq and Afghanistan. Using the entire common content of the Cooperative Congressional Election Study (n = 374,290), we measure the preferences of the American public on these issues and examined the legislative outcomes of each. Thus our approach to measuring representation addresses national opinion, districts, bicameralism, and party all together. We show that the outcome of the legislative process in the US Congress represents the majority will of the nation on 60 percent of key legislation. We further show that malapportionment and gerrymandering account for none of the instances in which Congress deviates from the American public, but partisanship and bicameralism explain roughly half of the representational failures of the US Congress. The remaining cases of legislation incongruent with the national majority appear to be due to other factors. Stephen Ansolabehere is an expert in public opinion and elections, and has published extensively on elections, mass media, and representation, political economy, and public opinion, especially concerning energy and the environment. He is author of five books: Cheap and Clean,The Media Game, Going Negative, American Government, and The End of Inequality. He is a Carnegie Scholar (2000), a Hoover National Fellow (1994), and Truman Scholar (1982) and was inducted into the American Academy of Arts and Sciences in 2007. He directed the Caltech/MIT Voting Technology Project from its founding in 2000 through 2004; is a member of the Board of Overseers of the Reuters Institute of Journalism at Oxford University; and consults for CBS News Election Decision Desk. 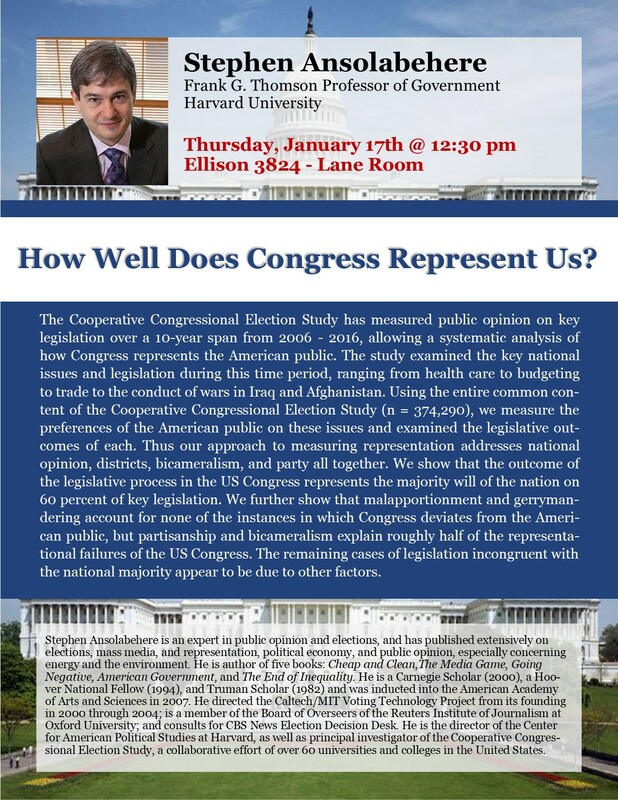 He is the director of the Center for American Political Studies at Harvard, as well as principal investigator of the Cooperative Congressional Election Study, a collaborative effort of over 60 universities and colleges in the United States.